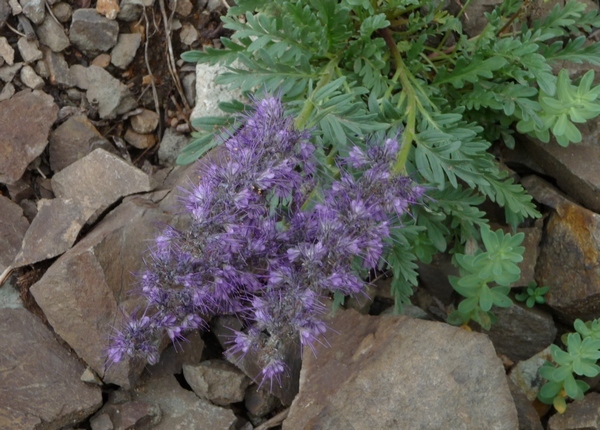 This is one I'd never seen before, and appears to be Purple Fringe, from the Waterleaf family. Last Saturday I made quite the circuit on the motorcycle—the rides are reported separately. Two of the roads I traveled, Ouray County Road 31 and San Juan County Road 14, are very near Red Mountain Pass and are at quite a high altitude. 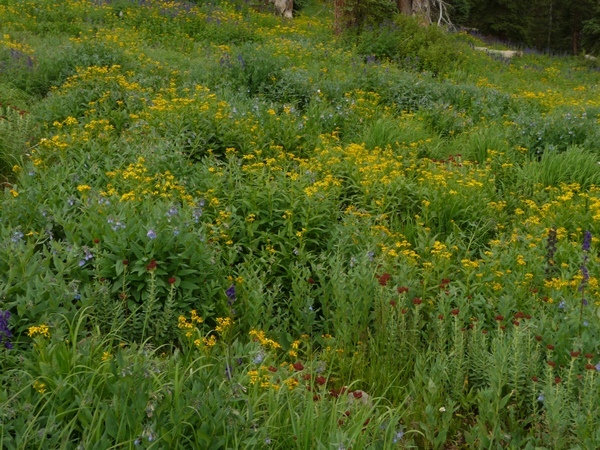 It was a cloudy, drippy day—perfect for photographing wildflowers. 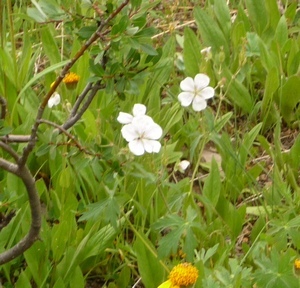 As I finished riding Ouray County Road 31, I remembered I needed to get at least some wildflower pictures for Mom. Well, I stopped by the Alpine Flox and got off the bike. It took me quite awhile to get back on! What you see here are the various pics I took. Several of these pictures were taken very near the south end of CR 31 and the others near the north end of CR 14—probably within a mile of each other and all very near Red Mountain Pass along US Hwy 550. Please enjoy the pics and if you have further information identifying the flowers, please comment using the form below. 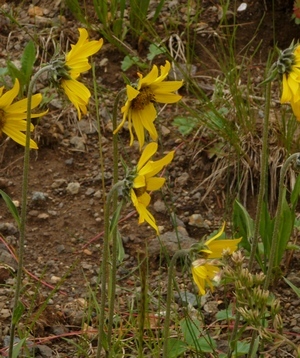 These are nodding sunflowers. They all face in the same direction. Appears to be Arowleaf Ragwort, a member of the Aster family. 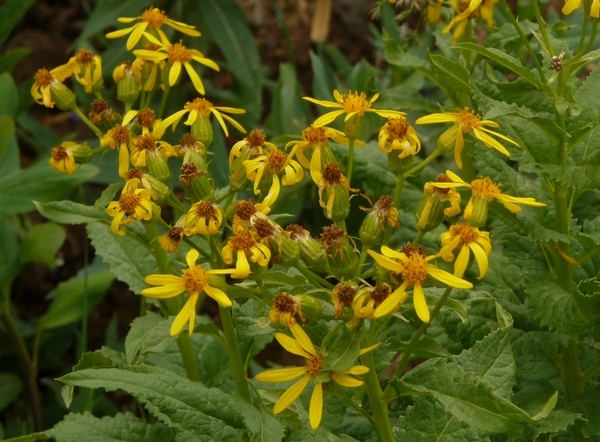 This appears to also be Arrowleaf Ragwort, though it's different from the previous picture. 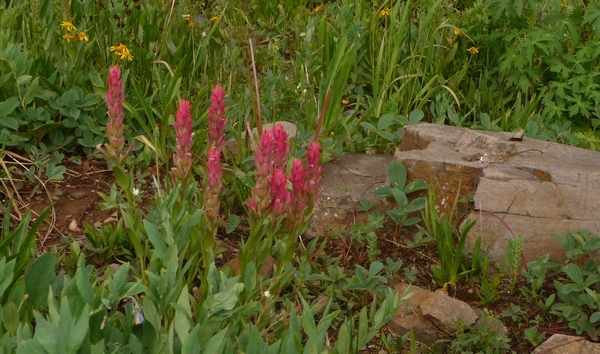 I think this is Rosy Paintbrush that hasn't yet bloomed. The leaves look right. 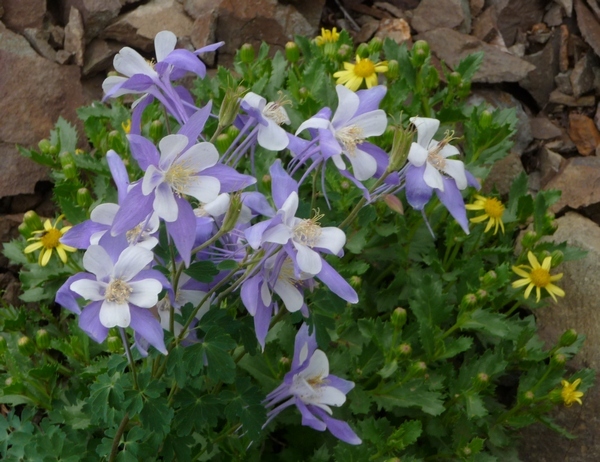 Here are more Columbines. They are everywhere this year! 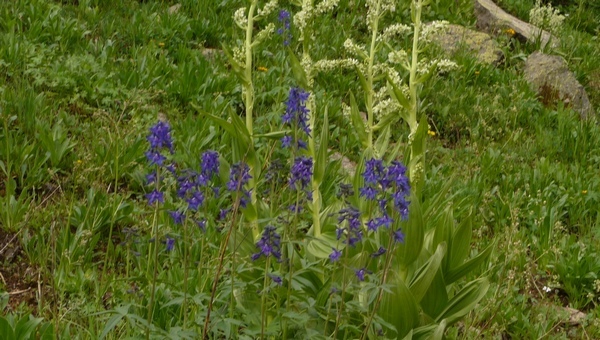 My pic is a bit blurry, but careful examination seems to indicate these are Subalpine Larkspur, a member of the Buttercup family. I've seen these rose-colored flowers in many places, but for the life of me I can't find them in the book. Any ideas? How many different species can you pick out? Dozens! Here are more of those rosy flowers, this time with a more-developed stalk. 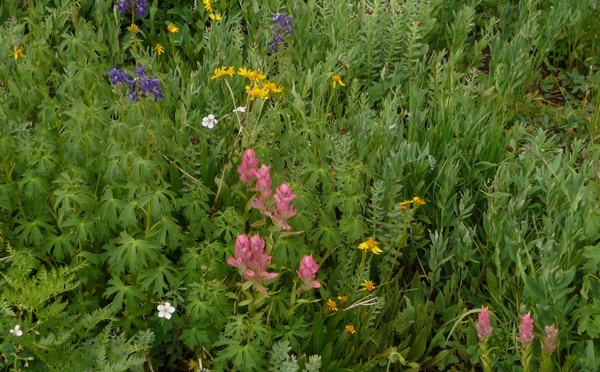 Here are more of those unidentified flowers, though these are more pink (the colors shown are pretty accurate).